« My Neighbor’s Friend Is a DJ! Everybody’s Got One, But Mine Is Bigger Than Yours! Everybody has a family. This fact is perhaps most apparent at weddings. 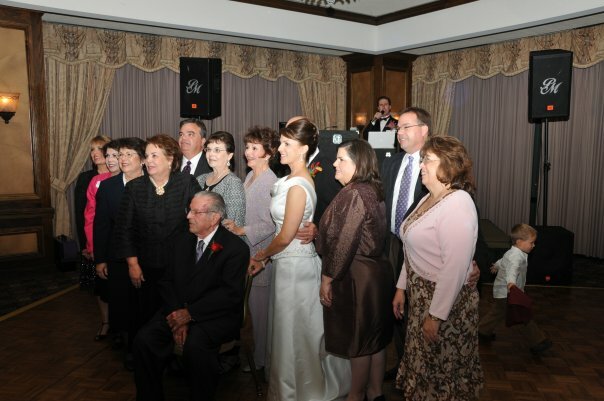 For many guests it is their first acquaintance with the bride or groom’s extended family. According to demographers, the average American family has between 2 and 3 children. My wife was the fourth of five siblings. Since some couples never have offspring, that means there are some pretty big families out there to buoy up the average. Bill Whittle married into such a family when he tied the knot with DeeDee Joachim. She was child number 18 out of 20. Joachim family pictures require a panoramic lens! Patriarch Jack Joachim, age 92, poses with twelve of his children at DeeDee and Bill's wedding at the Petroleum Club of Fort Worth. Our entertainment included a video presentation from a TV game show that originally aired in 1957 and featured the Joachim family, who numbered only 17 at the time. 50 years later, 12 of them were in attendance at DeeDee’s wedding, along with 92-years-young Dad, Jack. Octomom has got nothing on this family! This entry was posted on December 26, 2009 at 8:55 pm and is filed under Weddings!. You can follow any responses to this entry through the RSS 2.0 feed. You can leave a response, or trackback from your own site. Such a nice article, Scott. This event has proven all the more special to all of us today as we just heard of my brother Jerry’s sudden unexpected death. We celebrated Jerry’s birthday at the wedding. We’re so very grateful that we have photos and video footage of our beloved Jerry (#17) the month before his death. It is indeed an extraordinary blessing to be a part of such a large, loving family. We celebrated Daddy’s 93rd birthday on Christmas day. God blessed the world with the gift that keeps on giving the day he was born! Happy new year! Thanks, Dee Dee, and so sorry to hear about Jerry. This makes it all the more special that you had the opportunity to get the family together for your wedding. The longer I do this, the more I learn to understand the sacred importance of celebrating life’s most special times with family and friends, and to celebrate with enthusiasm, joy, love and laughter. Thank you for sharing this most special day. I am honored to get to be part of it, and congratulations to Daddy Jack. Scott, just wanted to let you know that we think its pretty great that you blogged about our family. It has been an honor and a privilege to be a part of something so special as our family. I am the daughter of #7 (Georgette) and have around 60 first cousins (give or take a few) just on that side of my family. You should make a trip down to Biloxi and have a bowl of gumbo with Jack. Thanks again! Thank you for your kind words; you are blessed to be part of an amazing and legendary family. Would love to share a bowl of gumbo with Jack! I have many fond memories of Biloxi and Gulfport, and have four palm trees growing in my yard that we brought home from Biloxi in a U-Haul trailer. Call me to entertain at your next Family Reunion – it will probably be bigger than some High School Reunions I have done! I second Cynthia’s feelings. I am the 2nd child of #9 (Marylyn) and had no idea as a small child that we were any different from any other family. I assumed everyone had over 60 cousins and called everyone Aunt _____ or Uncle _____. I am so blessed and thankful to be part of this truly incredible family. I pray everyday for a little of the wisdom, strength, and faith that my loving grandparents, Jack and Rose, passed onto their children. If you do ever come down to the coast, Jack can be found Monday – Friday at his favorite lunch counter near his house! But you’d better be there at 11:00, because he waits for no one!